Like in a group session, you need not keep an eye on your watch, the Meditation Timer is here to free your mind from the preoccupation of time. The Meditation Timer combines several functions: both those of the Meditation Timer and the Interval Timer. 1. Press the ON /OFF button to start the timer. A "Sitting Buddha" icon (duration of the session) appears with flashing figures. Press the + and – buttons to select the number of minutes you wish your session to last (max. 199 minutes). 2. Press the MENU button. A "Clock" icon (intervals) appears with flashing figures. Press the + and – buttons to select the number of minutes you wish to set the intervals for (max. 60). E.g. If you select 12, a single chime will sound every 12 minutes. If you prefer to have no interval chimes during your session, select 00. 3. Press the MENU button. A "Musical Note" icon (chimes) appears with flashing figures. 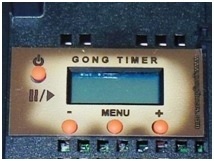 Press the + and – buttons to select the number (01 to 04) corresponding to the chime you wish to hear: 01 = dordje, 02 = bell, 03 = low-pitched gong, 04 = medium-pitched gong. A sample of each chime can be heard with each selection. 4. Press the MENU button. A "Loudspeaker" icon (volume) appears with flashing figures. Press the + and – buttons to select the number (01 to 10). A sample of the selected volume can be heard with the chime you have just selected. NOTE: You may change these selections by pressing the MENU button until you reach the icon symbolizing the menu you wish to change. You are now ready to start the session. Press the Play button. Ten seconds later, three chimes will signal the beginning of your session. The number of minutes displayed on the screen will decrease every minute. When 00 is displayed, another three chimes will signal the end of your session. Then the timer will stop automatically. The Meditation Timer can also be used to indicate the beginning and the end of a session for various therapies where peace and serenity are appropriate and a "plus". Who will benefit from the use of the Meditation Timer? The Meditation Timer was originally developed for the practice of meditation. Starting the session with the pure vibrations of the "singing bowl" in your ears, relaxation of body and mind is facilitated. The attention starts at the level of the ears, then vibrates throughout the body. All meditators have been distracted by the thought: "How long have I been sitting?" or peeped at the clock or been startled by the kitchen timer buzz. Acting as guardian of the time, the Meditation Timer frees the individual meditator as well as the time-keeper in group practice — and it plays this role harmoniously. For a peaceful transition, a few lighter and faster chimes immediately precede the last three louder chimes that signal the end of the programmed meditation period. Some therapists have found the Meditation Timer to be a precious partner in their practice. The serenity of the vibrating sound helps their patients relax from the very beginning of their session and then peacefully signals the end of the session. No need to watch the clock, attention is not distracted. More serenity and presence in listening.